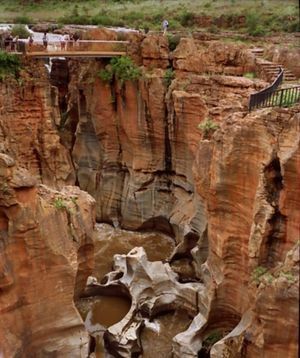 The Blyde River Canyon is a famous site with tourists visiting the Kruger National Park and its surroundings. The Blyde River Canyon is the third largest canyon worldwide, after the Grand Canyon (USA) and the Fish River Canyon in Namibia. 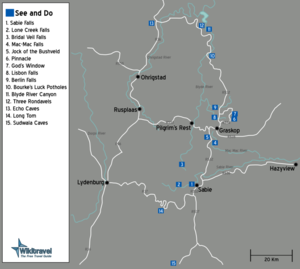 It is situated along the Panorama Route and easily accessible from the west of the Kruger National Park and the towns of Sabie and Nelspruit. If you come from Johannesburg, treat yourself with a drive through Belfast, Dullstroom, Lydenburg and Pilgrim's Rest en route to Graskop. If possible, spend the night in one of the hotels/lodges/camp sites on the escarpment and devote a day to exploring the whole Panorama Route. The canyon itself. There are waterfalls (Berlin and Lisbon), the Pinnacle, God's Window, Wonderview, Bourkes Luck Potholes (with a fascinating display of the wildlife and geology of the canyon) and several viewpoints, the best-known is The Three Rondavels/Three Sisters. Bourkes Luck Potholes - Named after a miner called Tom Bourke, who found a bit of gold here, but never got rich as the gold seam was located a short distance to the south of his claim. The potholes and rock formations are carved from the rock by water action at the confluence of the Blyde and Treue rivers. You may also see some local birds. There are hiking trails in the nature reserve and horse riding is a possibility, but most people seem to drive through it on their way to or from game reserves like Kruger National Park. Drive along the panorama route to see all the geological features such as God's Window, the Pinnacle and the many waterfalls. Many locals sell artwork here, ranging from those famous wooden giraffes to knobbly paper made from elephant dung. Prices are higher at more frequented sites and lower at spots off the main stream. Pancakes, savoury or sweet, in Graskop or Pilgrim's Rest. This page was last edited on 7 November 2015, at 18:55.